“Request for ID” – scam? It turns out that this was a legitimate request. Read this post for more details. Under new DTI regulations, we are now required to provide proof of identification when we propose a candidate to a client for consideration against a job vacancy. In addition, where applicable, please include a copy of your work visa. Post:  Computer People, Bristol Bridge House, Redcliff Street, Bristol BS1 6QP. Thanks for your assistance. We look forward to hearing from you. Posted on May 24, 2005 Categories general5 Comments on “Request for ID” – scam? I’m currently looking for a new job in the Bristol/Bath region of the UK, and it’s absolutely incredible how many job websites seem to think this includes Oxford, which is, at it’s closest, 84 miles and an hour and and a half’s drive away! You’d have thought some consideration for the M4 might come into it as well. Will Wright’s new game Spore, looks set to live up to the hype that’s been surrounding it since it was first announced, but on visiting the official website, I can’t help but wish that the actual graphics were the same as the excellent Flash intro. I love games with stylised graphics. They always seem more fun and more enjoyable than their ultra-realism-seeking counterparts (probably because the attempt always fails and it’s just painfully obvious that they’re failing, or the graphics are good but so jagged that it just takes away that send of realism). Some recent examples: I loved the graphics in The Wind Waker, Viewtiful Joe and Alien Hominid, and am eagerly awaiting the release of Okami (a game by the developers of Viewtiful Joe, in the style of Japanese watercolour paintings, there was some recent coverage at E3). Presumably everyone has seen this now (seeing as there are plenty of screenshots on Flickr and links on del.icio.us), but Google is trialling a customisable homepage. 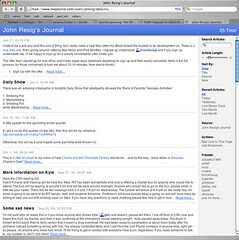 All of the headline are clickable and take you through to either the linked website story or, in the case of Gmail, directly through to the email page although it’s not framed by the rest of the Gmail interface, so is only useful for reading your mail, not performing actions on it, in which case you’ll need to get back into the main Gmail interface. I’m sure that this is a change which is in the works though. All in all I’m quite impressed. It’s certainly a move to a portal, but by allowing it to be optional, and then so easily customisable it’s already better than many of the alternatives. OK, so in my last post I rather eloquently described my distaste for the neutrino.xml format. Whilst it may be possible to implement most of what Neutrino hopes to achieve with OPML, this would be by convention rather than by design. Passing an OPML file to an aggregator gives no guarantees about what the file will contain or mean. Neutrino is specifically person-oriented whilst OPML is general-purpose. To this I say “Tish and pshah, OPML can have anything you like in it. Define some attributes and you‘re away!”, except of course this isn’t a very good solution because you‘re defining an arbitrary data set onto a format already used for something else within the syndication world. Whilst FOAF attempts to describe properties of an individual and their entire social network, Neutrino stops at the boundary of the individual. I hate to shatter the illusion, but a FOAF file doesn’t have to describe an “entire social network”, it can just describe a single person. In which case, we‘re in business. Regardless of this though, I firmly believe that a user shouldn’t have to know the URLs of any feeds in order to create a file listing their various feeds. Feeds which belong to and represent a user are very almost always going to be site syndication, and not synthetic (such as a feed of search results), and so a list of sites which provide feed autodetection should be sufficient. If my workplace suddenly decides to start syndicating their website in a feed, every member of that company shouldn’t have to go and update an XML file, it should already contain the main site URL and they can let autodetection do its work. What happens when my workplace silently drops their RSS 2.0 feed and switches to Atom? An ideal world would see a 301 redirect, but in the real world that doesn’t happen (especially not for weblogs in hosted environments or with the technological nous to do this), so I’d have to a) notice and b) update my file. Far better to have your file point at the site instead (i.e. what is actually being syndicated). In addition, people shouldn’t have to specify a title and description – these are elements present in the feed already! What’s with the duplication? Sometimes I wake up and hate the world. With all this talk of microformats, a thought just struck me – the biggest deal is being able to aggregate reviews of events. Gosh, wouldn’t that be something impressive for centralised services to be doing? Imagine being able to specify an event you attended in the past and have other people’s reviews of it come up. I’d be impressed (and I don’t mean that this data should be held in an event-specific service like upcoming.org – good as it is – but in people’s feeds and on their websites). But how do you do it? Just mix the namespaces in a single <item> for RSS2 and Atom? But what about when you’re writing a review of an event after you’ve already written about the event? Just put both sets of details in a new item? My assumption is that you’re posting your event data, and then your event review data in the same feed – how do the items relate to one another? I don’t think that <link rel=”related”…> can be enough, can it? I get the suspicion the answers are staring me in the face, but it’s been a long, long day. Can someone explain microformats to me? I’ve spent a lot of time thinking about microformats, wondering what they are, creating docs and writing code to deal with them, and my eventual conclusion is: I don’t get it. I quite genuinely don’t understand the point of microformats. Not only do I not understand why, but I don’t understand who they’re for, or how they’re supposed to be used. I understand attention.xml slightly better, and it’s a nice idea that aggregators should be able to standardize on a format for indicating such information as, the last time the feed/post was accessed, the duration of time spent on the feed/post, recent times of feed/post access, user set (dis)approval of posts, etc. but I just don’t understand the decision to use HTML. I think this is possibly also my problem with microformats in general. If they were in an arbitrary XML language, people would be looking at things like hCard, hCalendar and hReview decrying them as redundant, and point at existing XML formats for these things. I don’t see why putting them in HTML makes them any more relevant. In the same way, I don’t understand why attention.xml would be in HTML instead of by a strictly defined XML schema or even, Lord help us, OPML (the format, not the application). The one benefit I can see is that they’re instantly displayable on a webpage, but quite frankly, so what? Is this the magic that I’m not getting? (yes, I’ve read “Can your website be your API?”). Maybe I’d understand it better if everyone was serving up completely valid XHTML and we could query webpages for inline reviews etc. using XPath, but they’re not, and this isn’t likely to ever change. I understand structuredblogging.org slightly better, and I can understand both why, and who, even though I don’t have a copy of WordPress running for me to actually use the plugin they provide. It also makes more sense to me. This is how I’d serve up my data, XML alongside, or embedded within my webpage. Posted on May 11, 2005 Categories general4 Comments on Can someone explain microformats to me? Sometimes it’s just better to blog something then to spend time actually thinking about it. A week ago I saw this photo in John Ressig’s photostream and asked him to post a larger screenshot, which he did: .